A $4.5 million grant from the National Science Foundation (NSF) has been awarded to the Association of Universities for Research in Astronomy (AURA) for the development of a new “Windows on the Universe Center for Astronomy Outreach” facility at NSF’s Kitt Peak National Observatory. 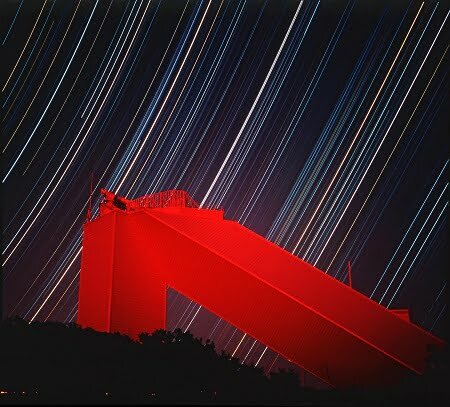 This is a nine-hour exposure of the McMath-Pierce Solar Telescope facility on Kitt Peak. The normally white building appears red due to high altitude haze following the 1991 eruptions of Mount Pinatubo. Courtesy of Bill Livingston, NSO/AURA/NSF. Located in the McMath-Pierce Solar Telescope facility, an iconic structure that was once the world’s largest solar observatory, the center will provide the public with a new way to experience the cutting-edge research being carried out at Kitt Peak and NSF’s other astronomy facilities around the globe including ground-based optical, radio, solar, and gravitational wave facilities. The grant will fund the renovation and transformation of the McMath-Pierce into an astronomy visualization and presentation center with potentially global reach. The center will feature data visualization systems, interactive exhibits, and a simulated telescope control room, which will give visitors the virtual experience of being at a telescope and participating in research carried out at NSF facilities around the world, including those in Hawaii and Chile and at the South Pole. To highlight its location in the McMath-Pierce facility, the center will feature special exhibits on the history of solar astronomy. The grant will also fund public programs, including educational programs to be developed in collaboration with the Tohono O’odham Nation. Kitt Peak National Observatory, which is located in the Schuk Toak district on Tohono O’odham Nation land 56 miles west of Tucson, Arizona, is part of the National Optical Astronomy Observatory (NOAO), which is operated by the AURA under an agreement with NSF. Visitors to the center will explore the wide variety of research carried out at NSF’s astronomy facilities, including Kitt Peak, Cerro Tololo Inter-American Observatory, Gemini Observatory, the Large Synoptic Survey Telescope, and the Daniel K. Inouye Solar Telescope — all managed by AURA — as well as the Very Large Array, Atacama Large Millimeter Array, South Pole Telescope, and Laser Interferometer Gravitational-Wave Observatory. “The mountaintop setting in Arizona will provide visitors with a unique exposure to the history of astronomy at Kitt Peak, and it will serve as a gateway to the science taking place at NSF facilities in remote sites around the world,” said James Neff, NSF program director.